As the first scene of Dee Rees’ epic Mudbound unfold, Two brothers try to dig a grave for their late father before a storm hits. When they realize the spot is a slave grave and must either bury him there or risk digging a new grave in the storm. They chose the latter, covered in the muck and stink of their decision. Such is the tone of Mudbound, a sweeping tale of two families: one white, the other black converging during World War II in the Jim Crow south. Taken from the bestselling novel of the same name by Hillary Jordan, the film illustrates the uneasy bonds between the two families as they both struggle for the American dream. It’s a story that is messy and gritty that doesn’t mind being so – told through the various perspectives of its characters. Rees sets the story beautifully giving just enough time to establish the two families. Laura (Carey Mulligan) meets businessman Henry McAllan (Jason Clarke), marries and starts a family where she is content in her domestic middle-classed haven. Meanwhile Hap Jackson (Rob Morgan) has dreams for he and his wife Florence, played by Mary J. Blige to save enough money tending to their parcel of land to eventually buy a place of their own. Things change quickly after Henry’s brother Jamie (Garrett Hedlund) and Hap’s oldest son Ronsel (Jason Mitchell) are drafted for the war. Henry decides to pursue his lifelong dream and buys the farm where the Jacksons are sharecroppers. Told from the perspective of its characters the story poetically intertwines the families so tightly through heartbreak, and pain. This is especially resonant as Jamie and Ronsel return home from the war with their own demons to bear. The voice overs couple the commonality of the husbands, wives, and soldiers as candid and often jarring events unfold. This film is rooted in pain and forces and unflinching view at its brutality and yet captures precious moments of grace and tenderness you easily become invested in each character’s story. This is a bold and aggressive film full of emotion and bitter truths which Rees explores so beautifully within a rich albeit tattered setting and subtle and tender performances. Blood and soil is a central theme throughout and no two characters prove this more than Jamie and Ronsel. Hedlund’s Jamie is physical and full of raspy cynicism that fits the character’s cultured yet detached perspective. His performance is full of verbose ramblings that brings a surprising lightness as he processes through his family’s new venture and the battle scars he brought home. Mitchell presents Ronsel with the quiet anger that is typical in Jim Crow films with clockwork precision. It’s the cynic of a different sort, one stuck in the misery of being and yet not being. In this Mitchell is masterful, and even more so when paired with Hedlund as their war-birthed brotherhood conflicts with the expectations of Southern civility. Mulligan’s demure visage as Laura is intriguing to watch. Uprooted from her cultured upbringing and placed in the ill-planned dream of her husband provides the backdrop for this subtle performance. There is a deliberate loss you witness her grasp for happiness in whatever form it takes. Similarly, Blige’s Florence has weathered the storm – she’s already been through the mud, so to speak, and has learned where to find her happiness in the everyday. Blige is magical to watch and gives power and strength to her scenes, especially when paired with Mulligan. While the acting is superb, so much credit has to be given to Rees. Starting with an amazing adaptation by herself and Virgil Williams, Rees captures the humbling reality of America with one foot deep in the traditions of the past, while the other tethered to the perspective on race and prosperity of today. Following Rees’ career, a project like Mudbound seems almost kismet. As in her debut film Pariah, Rees proves she has a knack for using narration to shape and unravel a character before your eyes using their own words to exploit their strengths and flaws beautifully. Rees has perfected her visual style as well. As in her previous films, especially her TV film, Bessie, she softens the harshness of the times with a lush, earthy pallete that makes it feel honest and pure. There are very few moments left to chance – so much so this film creates an almost perfect tableau vivant rich in the Jim Crow of the 1940’s and the pangs of war. It’s a true testament to her craft. As Mudbound ends you are left with a yearning for the next chapter. There is some finality to their story, yes, but it is still not enough. You hunger for more – more truth, more hope, more passion. 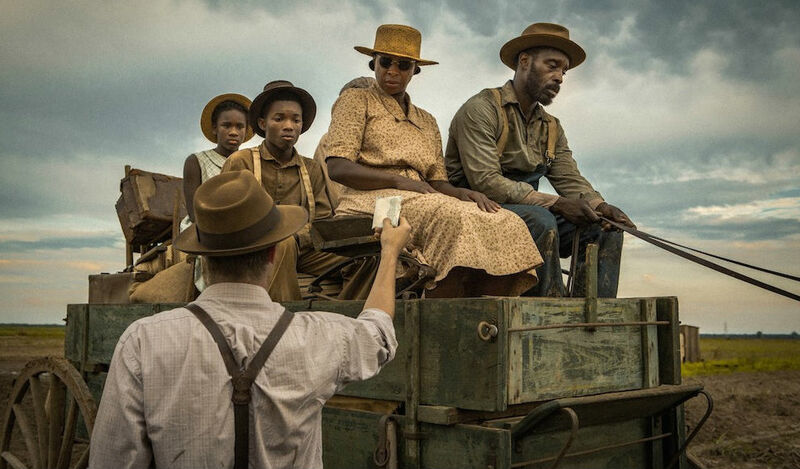 Mudbound is an epic story of the American experience that demands your attention from beginning to end – and rightfully deserves it.